11. The Ensemble Assembly! published on August 26, 2017 Read more posts by the author of 11. The Ensemble Assembly!, Jon "WB" Gray2 Comments on 11. The Ensemble Assembly! A few fine, fun folks about town! Check the alt text for more info! Check out my patreon for exclusive behind the scenes content and more! The companion comic to "Chip and Walter!" 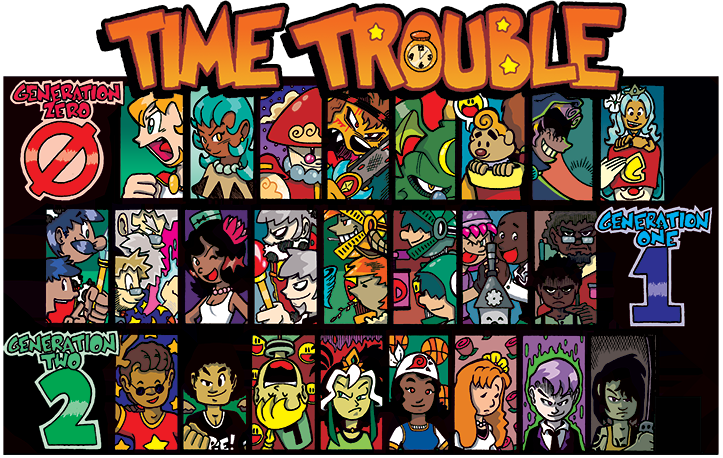 "Time Trouble: Generations" - Three interconnecting generations of heroes and villains shape the fates of two worlds and the myriad of characters within them! At the center of it – The Timestar – a strange pocket watch that bestows its selected "Timekeepers" with the powers of time and space! But monsters with evil ambitions lurk in the dark and the light, which means plenty of time trouble for everyone involved! Hello! If you'd like to know more about the author/artist of this comic and check out some of my professional works including Disney and Sonic, please check out my web page available at this link! I promise I won't bite! 12,023 visitors! Thank you for coming!